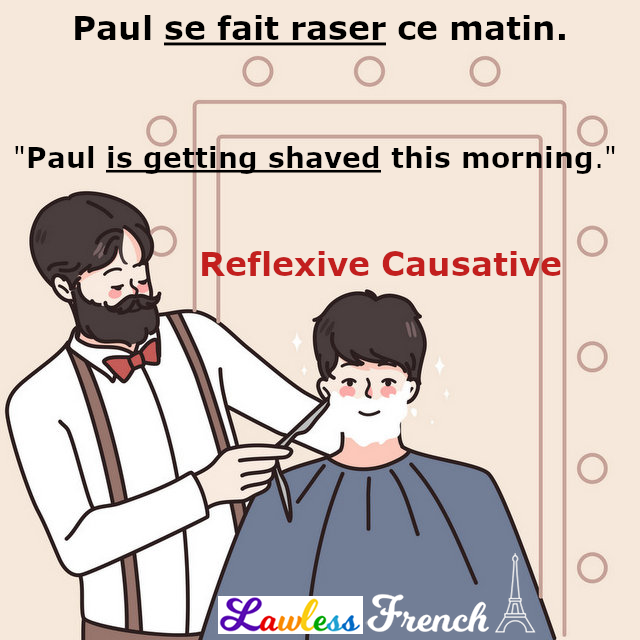 The reflexive causative uses a reflexive pronoun to indicate that the subject is acted upon, whether this action is by his choice or not. It’s equivalent to "get/have something done to/for oneself." The reflexive causative can indicate that the subject chooses to have something done to himself. Il se fait raser régulièrement. 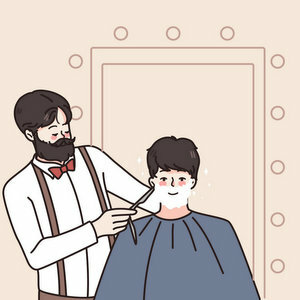 He gets shaved regularly. Je me suis fait réveiller à 8h. I got woken up at 8am. Nous voulons nous faire faire* des robes. We want to have some dresses made. *Yes, this is correct. See the note toward the end of the causative lesson. The reflexive causative can also state that something happens to the subject due to carelessness or some event out of the subject’s control. Tu te fais toujours avoir. You’re always getting fooled. Il s’est fait virer. He got fired. Attention, vous allez vous faire tuer ! Be careful, you’re going to get yourselves killed! There may be a direct object. Il se fait raser la tête. He gets his head shaved. Je me suis fait couper les cheveux. I got my hair cut. Vas-tu te faire faire un gâteau ? Are you going to get a cake made for yourself? Unlike in the regular causative, there can be no named agent in the reflexive causative, because the reflexive pronoun indicates that either the subject is his own agent or the agent is unknown. In terms of accidental/passive events, what’s the difference? The choice of the reflexive causative over the passive voice implies that the subject had something to do with what happened to him – it probably wasn’t a complete accident. Il s’est fait tuer. He got (himself) killed. Il a été tué. He got/was killed. In the first example, the reflexive causative implies that the subject did something reckless and was killed, while in the second, the passive voice gives no indication as to whether the subject did anything wrong. Merci d’avoir créé cette article, c’est bien écrit. Si je voudrais dire en français ‘He left his violin at home. He is getting it brought here’, ça serait ‘Il a oublié son violin chez soi. Il se le fait apporter ici’? Je comprends la construction et je suis maintenant fort en langues vivantes grâce à Lawless French, mais je voudrais savoir où je me suis trompé, dans ce cas. I saw this example above: “je me suis fait reveiller a 8 heures” ( I got woke up at 8). If you wanted to say, “I was awakened at 8″, would you say ” je m’etais fait reveiller” ? “Got woke(n) up” and “was awakened” are in the same verb form (past tense passive voice), so je me suis fait réveiller (past tense reflexive causative) is the correct translation for both of them. When the agent is known am I correct in thinking that it would be a causative construction, instead of a reflexive causative construction? J’ai fait couper les cheveux à / par ma fille. I had my hair cut by my daughter.